Featured: Wrestling Revolver #Revolver3Year May 10 in West Des Moines, IA! NXT TakeOver: New York (or TakeOver: Brooklyn V?) came, conquered and impressed everyone in all its glory. 300-pound Heavyweight Hanson performed a handspring back elbow and a top rope senton to the floor, Velveteen Dream was the GODDAMN STATUE OF LIBERTY and the main event between Johnny Gargano and Adam Cole delivered more wows than a summer blockbuster. 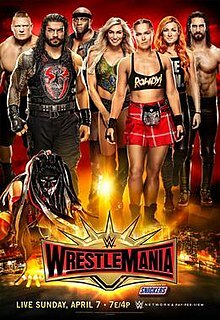 To be frank – WrestleMania will pale in comparison to its NXT counterpart and that’s to put it nicely, despite the fact that Mania will run more than twice the amount of time and contain more than three times as many matches. Below are our predictions to shape Mania into a halfway decent show. If you’ve followed the Raw side (without falling asleep), the build has been abysmal while SmackDown has held themselves together better thanks to Kofi Kingston’s journey, but there are still some flaws here and there. “Notes In Observance” features random thoughts and analysis on recent television shows. Quick results can be found at the bottom of the post. – The opening WWE Raw Tag Team Championship Triple-Threat match between Champions Big E/Kofi Kingston, Luke Gallows/Karl Anderson and Cesaro/Sheamus was a welcome change, especially with the energetic Philadelphia crowd. They dug The New Day and there was a different feel since at midnight, they’d tie Demolition’s 478-day reign. An obstacle was made for them – the two biggest threats to their Titles. They cut a pre-match promo that got the crowd on their side, especially when Xavier Woods dedicated the night to his apparent late Grandma, which began a “Grandma” chant. That transitioned to the actual match. Gallows/Anderson were easy to root against and Cesaro/Sheamus had the unique dynamic with the “Boo/Yay” difference. We also saw a celebration room prepped backstage, complete with a Booty-O’s punch bowl, because why not? Plenty of heavy action that highlighted everyone and great near-falls as it developed. Gallows/Anderson almost won on a Boot Of Doom, but Cesaro literally dove onto the pin at the last second to stop it. Cesaro hit an offensive tear, got a pop for the Big Swing and had the sharpshooter applied. The finish was a well-done way to have ND “steal” the pin, but in a way that wasn’t cheap and spread disappointment on Cesaro/Sheamus at not getting the job done. Kingston hit Trouble In Paradise on Sheamus, while Cesaro was held down by Big E from stopping the pin. Good energy in that opener and we took a glance at the celebration room, which had Bob Backlund and Darren Young in there, along with extras. – The opening in-ring segment with Goldberg, Paul Heyman and Rusev was newsworthy to say the least. Sure, Goldberg’s the biggest Survivor Series draw, so they were smart to have him appear here. Now, his reaction from the fans was polite, but lacked the electricity from his Denver promo. We did like that Heyman was back to his old-school heel ways as he fished for heat. With that, he added a “Gotcha!” moment as he teased an appearance from his client Brock Lesnar and revealed he wasn’t there. As far as Rusev’s involvement, it made sense for him to approach Goldberg to downplay his ego and legend status only to suffer a jackknife for his troubles. The Lana chants were loud enough where he should’ve acknowledged them for more heat, but it was what it was. Many people will point out “The Slip” as a severe critique that Goldberg circa 2016 is a mistake, but we thought he covered up well, as he sold it like a pseudo-takedown. The biggest reaction was rightfully the spear on Heyman, which left us to wonder how Lesnar would respond. With two more weeks of SS hype to go, let’s hope they intensify it with a brawl or something like that. – With Hell In A Cell six days away and a decent Triple-Threat main event that pit Chris Jericho, Seth Rollins and WWE Universal Champion Kevin Owens together and also another “Homecoming” for Brock Lesnar, we had some glitz to the go-home glamour. The in-ring segment with Rollins, Owens, Raw Commissioner Stephanie McMahon and Jericho put the focus on the most entertaining part of the Rollins-Owens feud – the “best friendship” with Owens and Jericho. This time, the “twist” was that Jericho’s beloved List Of Jericho had been stolen. It says a lot about Jericho that he managed to get a big reaction from people about a fictional list. It was a classic Jericho sit-in, as he claimed the main event wouldn’t happen without his list. Owens’ involvement here raised our interest a bit since the first question was if he had the list, which he didn’t. Steph’s involvement made sense since she wanted Owens/Jericho on the same page to take out Rollins. Rollins here brought everything together as he possessed the list and took more cutesy jabs at the best friends’ with what he claimed was on the list. He finally brought it home as he used “list” terminology to sell their HIAC encounter with what injuries Owen would sustain. We also liked that he put over how he was victorious in the structure, which was an advantage he had. The hook here was that Rollins walked away with the list, which sent Jericho into a frenzy. Entertaining stuff. – With two weeks to go before yet another Pay-Per-View in Hell In A Cell, we started things off with arguably WWE’s most over duo – WWE Universal Champion Kevin Owens/Chris Jericho. Their in-ring promo was excellent heel work, as Owens accused that Raw General Manager Mick Foley had a vendetta against him for his placement in the HIAC structure. Jericho drove the point home that HIAC wasn’t a reward and put over the dangers. Thank god. Jericho also mentioned how many legends he beat and that he should’ve beat Seth Rollins last week to get in on the HIAC Universal Title match, but “bad officiating” cost him. They also played up the legitimacy of Owens/Jericho’s friendship once more with Rollins’ help, which the live crowd took to. Rollins was more cutesy than usual (almost Roman Reigns-like) but because his target was Jericho, “Sparkle Crotch” went over well. We also had Rollins point out his two pedigrees on Jericho while Owens watched, to which the Champ’s retort was that Rollins only saw the worst in people and that was why he didn’t have any friends. Rollins suggested a rematch with Jericho, as we saw Jericho tell Owens he didn’t want him at ringside this time because he “knew his tricks.” They’ve teased the right amount of tension between Jericho/Owens, while Rollins slowly gets over as a babyface in the process. – Raw came from the Bay Area this week and after Sasha Banks regained the WWE Raw Women’s Championship from Charlotte in Los Angeles last week, they were smart to follow up with Banks coming out first. She actually had a moment to establish an “inspirational” character as she spoke about how she watched WWE at a young age and looked up to Eddie Guerrero, Trish Stratus and Lita as role models. Now she stood as a lady who could main event the show and fly around the ring. That’s a hybrid if there ever was one. Anyways, the big news here was Banks’ proposal to give Charlotte her Hell In A Cell rematch in the infamous structure. Huge pop. We were interested to hear Charlotte’s response before she was interrupted by Rusev/Lana. Rusev looked a bit different with facial hair and not in a good way either. He showed more misogynistic tendencies as he snatched the mic from Charlotte and claimed nobody cared about the ladies. Charlotte snatched it back and accepted the HIAC challenge before Rusev grabbed it back and called her a “Black swan.” Banks grabbed it before Lana called them “lost women who needed to know their place.” In an odd twist, we saw Charlotte/Banks team up to clear the heels from the ring. WWE United States Champion Roman Reigns came out to boos as he approached the ring. Rusev went back in and again backed away from the Champ. We liked the female alliance despite their stance as enemies for the greater good. We’d guess a mixed tag of sorts, though it looked like it should be Banks/Charlotte against Rusev/Lana based off that. – With the WWE Brand Split officially in play now, we were curious to see what changes would come about to the flagship brand and it was apparent early on that they were serious about this thing. 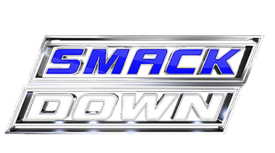 Right from the opening video that highlighted WWE World Heavyweight Champion Dean Ambrose’s successful defense at WWE Battleground, we saw big visual changes – a new theme, show montage, Corey Graves replacing JBL on the announce team, which had its table relocated again near the stage a la NXT and the old draft days in 2002-2003. We were okay with this. – We applauded the Battle Royale opener to decide who’d challenge WWE United States Champion The Miz at Battleground that featured the likes of Darren Young, Apollo Crews, The Usos, The Dudley Boyz, The Vaudevillains, The Ascension, Dolph Ziggler, Baron Corbin, Alberto Del Rio, The Golden Truth and Jack Swagger. It switched things up and also gave us Young’s long-awaited “re-debut,” who now had Bob Backlund at ringside. Thankfully, Crews also got a televised entrance and even Corbin was pushed like a beast here to the end. Miz’s pre-taped promo was well-delivered and he stood on commentary, even if he messed up a few lines. The finish was okay, just wasn’t a fan of how Young was the winner mainly for how he stood in the background as Crews/Corbin went over the top rope together. Perhaps it wasn’t the planned finish? Crews looked like he tried to hold on, but fell with Corbin. Luckily, the crowd bought into it and they chanted for Young as he and Backlund celebrated in the ring. Young was later hyped for a SmackDown appearance on MizTV, so that could also be fun. – The “Highlight Reel” segment with Chris Jericho, Sami Zayn, WWE Intercontinental Champion The Miz and Maryse was a good opener, in that it did several things within 10 minutes. Jericho got to brag about taking Dean Ambrose out with his potted plant, Mitch, on Raw, building some good heat and making us anticipate Ambrose’s return for the following Raw. Apparently getting hit in the back of the head with a potted plant can cause contusions, bulging disks and signs of whiplash, so be careful out there. Zayn fit nicely in this segment, talking well for himself when accused of being a “sore loser” and “thief” by Jericho. Jericho had good heel logic in pointing out that Kevin Owens beat Zayn fair and square and got attacked for it the next night, while Zayn said his reasoning was because of Owens’ actions after their Payback match when he threw him out of the ring after slapping him. All the talk of the IC Title brought out Miz, who was the proud Champion who was offended at having his property touched by Zayn. Also liked the line where Miz put over his 11-year experience in the business comparing it to Zayn’s “kiddie pool” experience. Zayn continued to poke fun (literally) by touching Miz’s belt. Jericho leaving his own talk show segment felt random, but fit his character. Also liked the hook if the Zayn-Miz match was going to happen after some brief physicality. – Opening video time… Yup, Mr. Deep Voice Narrator was back, as he broke down Payback’s important occurrences – Vince McMahon deciding Shane/Stephanie McMahon would run Raw, both playing a role in the main event’s decisive winner. Of course, the focus was on typical mcMahon family drama during what’s repeatedly preached as a “new era.” What’s new about this again? Enter your email address to follow PWO and receive notifications of new posts by email.